The PocketStation is a peripheral by Sony Computer Entertainment for the PlayStation home video game console. Categorized by Sony as a miniature personal digital assistant, the device features a monochrome liquid crystal display (LCD), infrared communication capability, a real-time clock, built-in flash memory, and a sound capability. Connecting to a PlayStation through a memory card slot, the PocketStation also functions as a PlayStation memory card. It was released exclusively in Japan on January 23, 1999. The original Japanese ship date for the PocketStation was set for December 23, 1998, but it was delayed a full month. 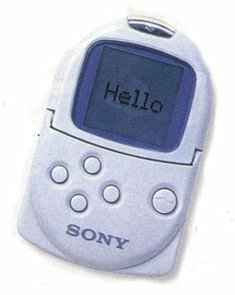 Sony only shipped an initial 60,000 units of the peripheral when it was released on January 23, 1999. It was initially available in two case colors: white and clear. The PocketStation was discontinued in July 2002 after having shipped nearly five million units.